As you see I've got the first club card in this fitness center. I've been attending this club for three months and someone else with me! 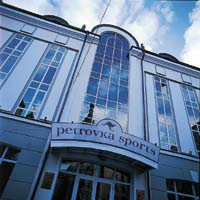 Welcome to the fitness center Petrovka Sports! Our club is situated in the center of Moscow in the separate building of five floors, specially planned for the fitness center. The building, design and the equipment were executed under the management of German specialists. The employees of the center had training in Germany and have very good skills and knowledge for the high professional work and instructing. There are many stars, movie stars and politicians among the members of the club. No wonder, as we should care of our health, physical state and good mood in the time of constant stress we are living. A wide choice of various physical exercises and services let any person to select necessary exercises, food and procedures. All that is under the strong control of the doctors, instructors and consultants. The remarkable arsenal of modern equipment let achieve the quick results. Many specialists creating the fitness center did all their best to help you to keep the best form.